Wash broccoli crown, drain and chop into small florets. Heat 2 tablespoons olive oil in a cast iron skillet (or other oven-proof skillet) over medium heat. Add in broccoli, salt and pepper and toss to coat. Place in preheated oven. Cook for 10 minutes. Stir and cook for another 10 minutes or until tender. Remove from oven. Now add roasted broccoli and 3 cups of broth/stock and cook in medium heat for 25 minutes. Once the potato turn soft and tender, turn off the stove and allow to cool for a while, or blend it using hand blender. Or cool for a while and grind it in a mixer to smooth and transfer to pan and add salt and pepper to taste and simmer for 4-5 minutes. 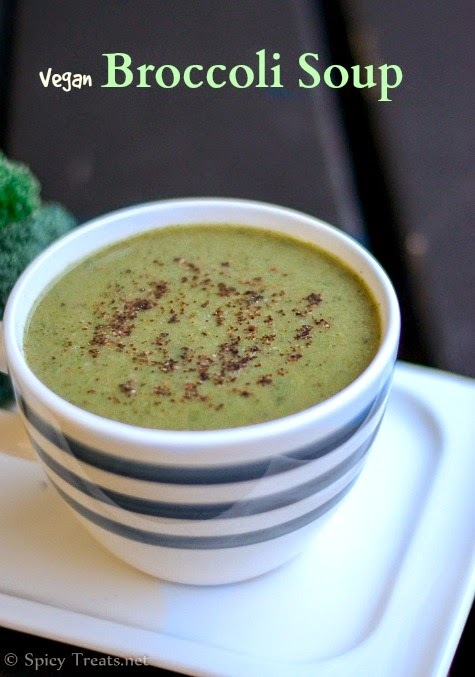 That's it...Delicious Broccoli Soup ready. Serve warm with any crispy bread. You can also use Store bought stock or broth, but making veg stock at home is very simple and free from preservatives. Instead of oven roasting, you can also grill it or toast it in tawa on stove top. You can either blend portion of a soup or blend everything. I also don't like creamy soups. This soup sounds so healthy and filling. Nice pics. 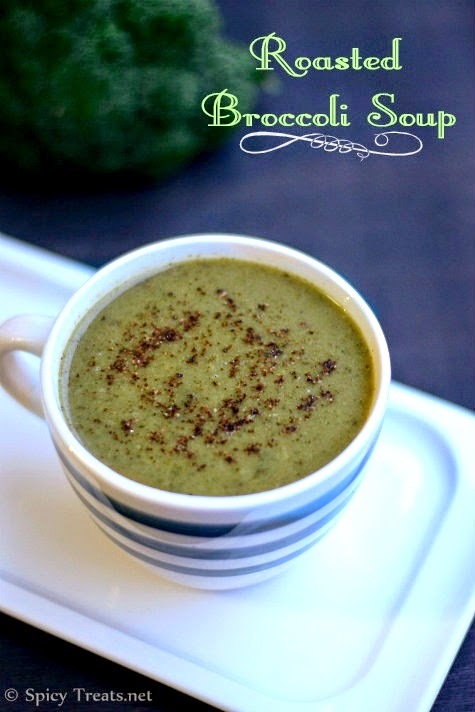 I have never tried broccoli soup without milk or cream...Love your idea of using veg stock. Looks fantastic!! Thank you so much for trying and sharing your feedback. Glad you liked it. Soup looks delicious, I make it on stove top, roasting in the oven would give a nice flavor.. Awesome soup!!! In this cold here this would come in very handy. delicious soup. 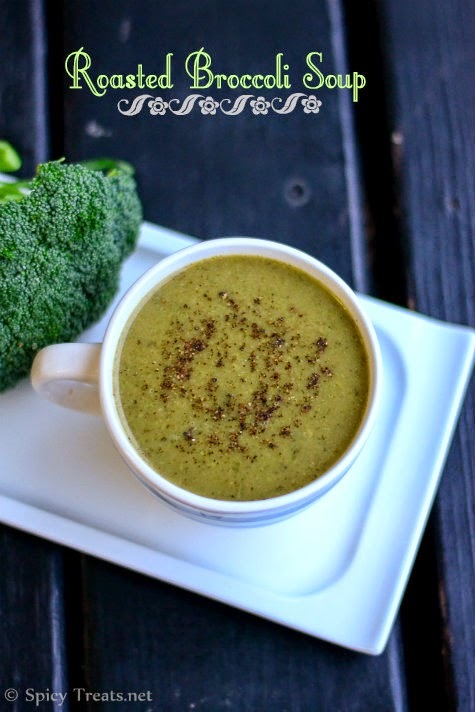 Next time I make this soup I will roast the broccoli. looks delicious for the perfect chill weather,happy that it doesn't use cream..yummy !! 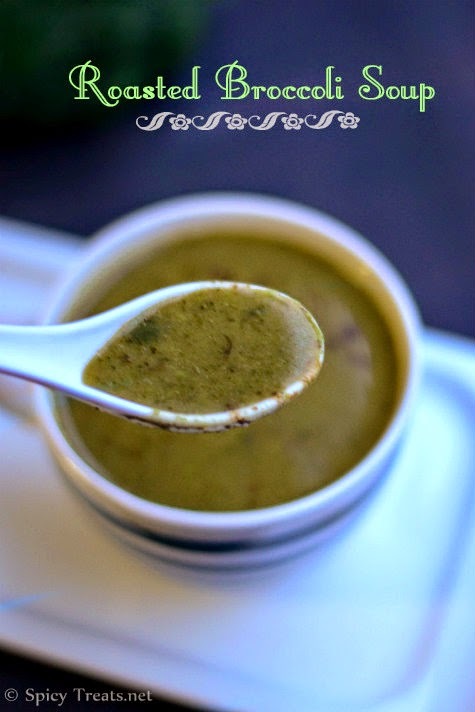 i love such yumm delicious healthy soups..